When running a business it is simply essential to track the keyword rankings of its website. Up to hundreds of competitive keywords might be relevant for a website, it is impossible track this manually. By tracking all keywords regularly a website owner knows where to apply SEO and if invested SEO is effective. Tracking keywords is not just essential, it's also a joy to watch rankings progress positively. Our service is designed to be used by individuals, professionals, corporations and SEO companies. It does not matter if you want to track your personal website or shop, your corporation websites or thousands of customer websites. The beautiful reports, charts and tables can be viewed on our website but also exported fully automated, the data is easily accessible. This means our service can be used completely transparent without disclosing our service to your customers. If you have never created a project it's recommended to take a look at the "Demonstration" project to see a minimal example configuration. A "project" or "job" is the core of each tracking activity. There is no limit on the number of active jobs you may create, each may contain up to 500 keywords that are tracked precisely in a configurable interval. The process of tracking keywords is also called "sampling". A sample contains all keyword rankings gathered at a specific moment. You start by clicking the icon and choose a unique job/project name in the popup dialog. It is recommended to add a "locale" identifier at the end of your project name. For example "myWebsite-enUS"
Now choose the country and language for your project, the default for US results is "United States / English". Next fill your website hosts, optional competition hosts and your list of keywords into the respective fields. Keywords and hosts are always entered line by line. Website hosts can use wildcards, for example "*mywebsite.com*"
This setting would search all keywords for an URL containing "mywebsite.com", the highest rank will match. You can also specify a more exact match, for example "https://www.mywebsite.com/*"
If you would like to monitor competition websites you may enter them optionally into the correct field, similar as your own websites. Keywords are also entered line by line, the fields are fully UTF-8 supporting so you may use any language of your choice. Finally choose the samplerate and sample depth. The sample rate ranges from "hourly" to "monthly" but also has an option "stopped" to completely halt the tracking. The sample depth ranges from 100 results per keyword up to 1000 results per keyword. Finally click the " Store changes" button and confirm the new configuration. Please note: As soon as website hosts, keywords and a sample rate were configured the tracking process will immediately start. It is recommended to keep the sample rate at "stopped" at first and review the new project before starting. The "Summary" tab on the right shows the Credit cost per sample, this price will be deducted from your wallet at each sample. For example when a sample rate of "monthly" is selected the Credit cost per sample will be deducted once per month. It takes between 1 and 30 minutes to finish sampling a project, depending on the amount of keywords and sample depth. The current status can be checked at the " View Reports" tab. Currently there are 5 different reports available, each containing different data, charts and tables. After choosing one of the 5 reports by clicking the respective button you can choose websites hosts, competition hosts and keywords to be included into the report calculation. Depending on the report of your choice the selectable options will be limited. A yellow glowing border signals that a selection should be made. This generates a view with all keywords of your selected project for your selected website(s). Each keyword is evaluated to show the ranking changes from first to last sample within the selected time frame. By clicking on one of the keywords an additional report is shown with detailed ranking changes. This report will show a general overview over all keywords for the selected website(s). It will show graphs for the selected time frame that visualize the number of total keywords ranked for each host. An additional graph displays the average rank for each host. Up to 20 keywords may be selected, they are all displayed within one graph. If more than one website was selected only best rank will be shown for each keyword. The search engine market analysis displays tables with SEM information scraped for the specified time frame. Each creative advertisement URL that was found is listed as well as it's best rank and the number of occurrences per sample. This allows to judge how much budget your competition is investing and shows all the competition found. The SEM view is also useful to see how often your own ads are actually shown by Google or Bing. The competition analysis allows to compare your own website(s) with selected competition website(s) for one specific keyword. In addition to selecting the report you can also select the time frame between days and years. You may also use the time navigation buttons to see older or newer ranking data. The button " Switch to selected report" will update the currently displayed report with the selected choices. The charts are interactive, you may hover over datapoints or click the legend to toggle visibility. You may also right-click a chart and store it to your local disk. 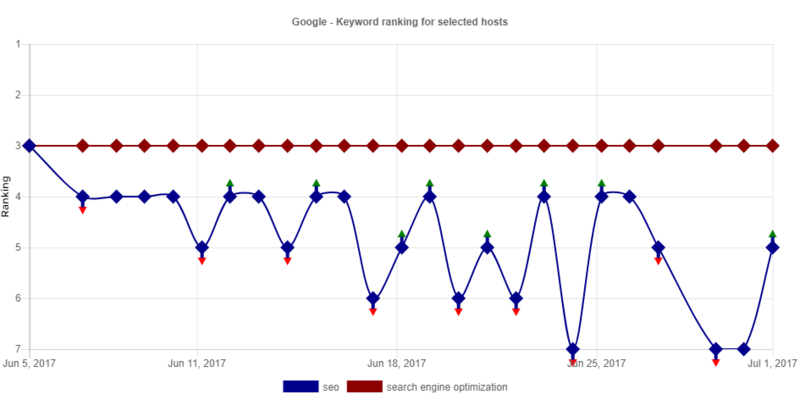 As you can see in this graph example the ranking stability of a keyword can be very strong or quite weak. Only professional rank tracking can detect such a scenario and explain sudden or periodic drops in sales or visitor numbers.